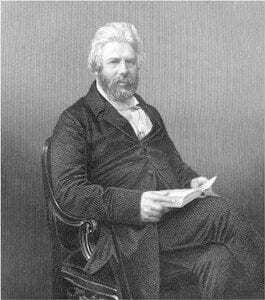 Robert Chambers was an Edinburgh publisher who anonymously penned a best selling book on evolution in 1844, Vestiges of the Natural History of Creation. The book was an absolute sensation and was read by Queen Victoria and Abraham Lincoln. Within a matter of years, it would pass through ten separate editions and would continue to maintain total sales exceeding those of On the Origin of Species through the 1880s. In the absence of international copyright law, at least four different publishers reprinted Vestiges in the United States. Robert Chambers’ authorship was only revealed after his death. For an excellent account of the publication of Vestiges of the Natural History of Creation, please read Victorian Sensation, The Extraordinary Publication, Reception, and Secret Authorship of Vestiges of the Natural History of Creation, by James A. Secord, 2000. 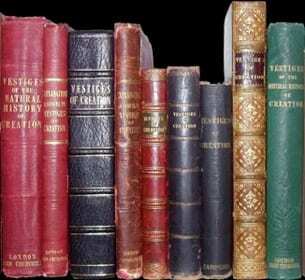 A few of the many English and American editions of Vestiges printed between 1845 and 1860. Click here to read this book.